The Town of Hancock (pop. 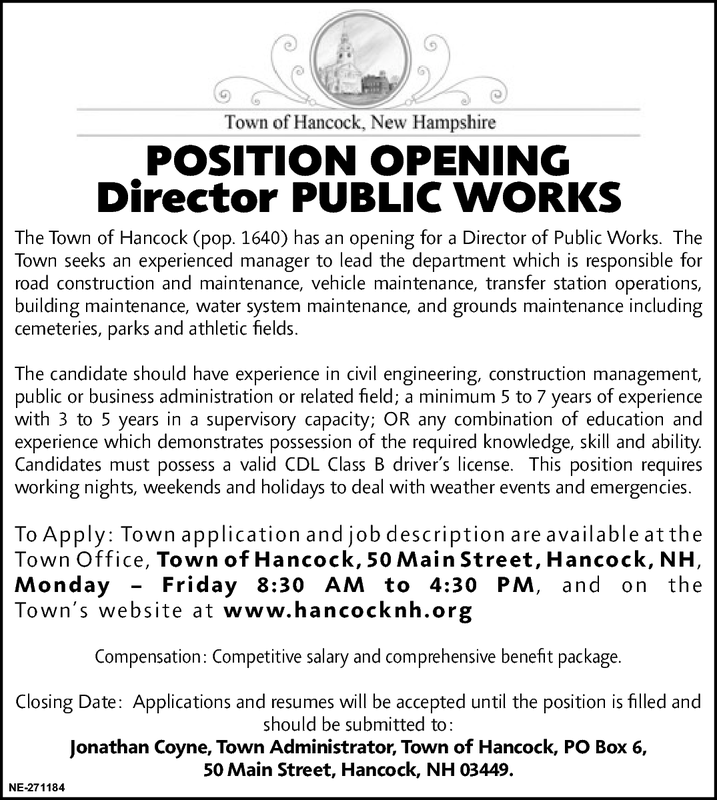 1640) has an opening for a Director of Public Works. The Town seeks an experienced manager to lead the department which is responsible for road construction and maintenance, vehicle maintenance, transfer station operations, building maintenance, water system maintenance, and grounds maintenance including cemeteries, parks and athletic fields. The candidate should have experience in civil engineering, construction management, public or business administration or related field; a minimum 5 to 7 years of experience with 3 to 5 years in a supervisory capacity; or any combination of education and experience which demonstrates possession of the required knowledge, skill and ability. Candidates must possess a valid CDL Class B driver s license. This position requires working nights, weekends and holidays to deal with weather events and emergencies. Competitive salary and comprehensive benefit package. 50 Main Street, Hancock, NH 03449.